2017 – astronauts set foot on Mars. 20 years later colonisation has begun, mining is in full swing, and the goals of scientific research are becoming muddied with profit and survival. Competing factions are growing stronger, and the engineers and scientists of the United Nations Space Co-ordination Agency are finding that even they are not immune from the petty politics of the red planet. Outpost Mars is a roleplaying game set on this newly-settled planet. Players take the roles of scientists, engineers and explorers going about their business of investigating Martian phenomenon and avoiding death or serious injury while doing so. The real story focus, however, is on the player characters and their motivations. Trapped on Mars, working in isolation with the other player characters in the team, games will pick up on and revolve around a character's personal interactions with his team-members. On their rivalries, secrets, hidden agendas, lies and on their mutual interests. There are factions and social organizations on Mars with their own agendas and plans. From the ESA to NASA, the Red Legion to the Rovers. A player must, during character generation, ally his character with one of these group and choose a faction that reflects his goal. If the character wants to keep Mars pure and unspoilt then he can ally with the terrorist group called the Red Legion. The choice a player makes about his character's allies and personal agendas is perhaps the most important part of the character creation process. His ally group will provide the character with objectives to achieve, special information, tasks that need accomplishing, rivals to watch out for - indeed an entire agenda. Of course, the character's choice of ally group needs also to colour and support his background, his personality and his skills. A law-abiding engineer will not want to associate with the destructively criminal Red Legion, for example. 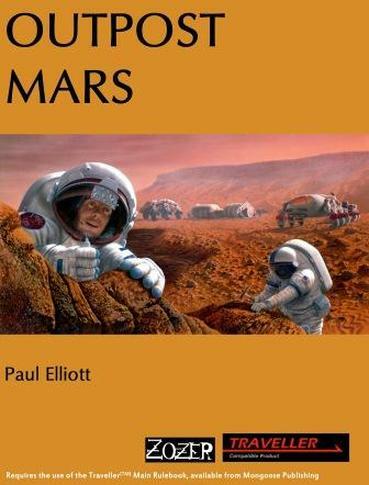 Beautifully illustrated with NASA commissioned art-work.